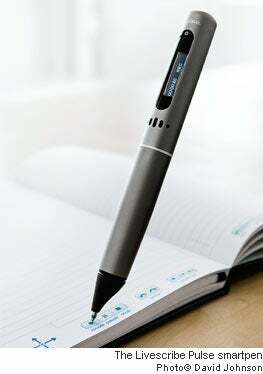 The Lifescribe Pulse smartpen records and stores what you're writing--and hearing--as you write. Even the simple act of writing just got a lot more high-tech. The Livescribe Pulse smartpen is a computer in a pen, more powerful than the old PC you use at home when your kids kick you off the new one. When you write on special dot matrix paper, the Pulse records and stores what you're writing--and hearing--as you write. Later, by pressing the pen to different sections of your notes, you get a playback synchronized and in context with what you've written. Since no one ever takes legible notes, the pen's playback may be the difference between fully understanding a business presentation and misunderstanding it completely. Plus, the Pulse can create "Pencasts" based on your notes than can be downloaded by employees, partners, customers or just some weirdo who loves pencasts. At about $200, the Pulse isn't cheap--plus, extra matrix notebooks run $5 each and refills are $1.25 each. But the Pulse's value is that it's getting iPhone-ized: Livescribe is creating an app store and has signed up thousands of developers to create new business apps for the Pulse. Face it: If this pen were any smarter, it wouldn't need you.